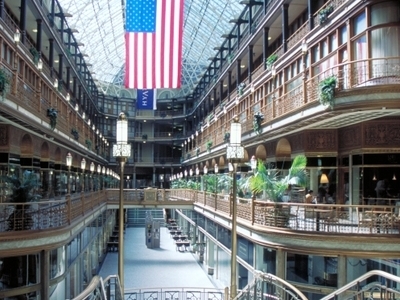 The Arcade in downtown Cleveland, Ohio, is a Victorian-era structure of two nine-story buildings, joined by a five-story arcade with a glass skylight spanning over 300 feet (91 m), along the four balconies. Erected in 1890, at a cost of $867,000, the Arcade opened on Memorial Day (May 31, 1890), and is identified as one of the earliest indoor shopping malls in the United States. The Arcade was modified in 1939, remodeling the Euclid Avenue entrance and adding some structural support. The Arcade was built in 1890 by Detroit Bridge Co., run by Stephen V. Harkness. It is a unique architectural treasure of 19th century urban America. Designed by John Eisenmann, the Arcade is one of the few remaining arcades of its kind in the United States. Modeled after the Galleria Vittorio Emanuele II located in Milan, the Arcade comprises two nine-story towers with a skylight, 100 feet (30 m) high, made of 1,800 panes of glass spanning over 300 feet (91 m). The construction was financed by John D. Rockefeller, Marcus Hanna, Charles F. Brush and several other wealthy Clevelanders of the day. Here's the our members favorite photos of "Malls in Cleveland". Upload your photo of Cleveland Arcade!